Sea Wolf, an indie-rock group from Los Ange­les, was found­ed by Alex Brown Church, the founder of indie group Irv­ing. The band has become grad­u­al­ly bet­ter known since their 2007 album “Leaves in the Riv­er,” two tracks of which have appeared in adver­tise­ments. Sea Wolf relies on a care­ful mix of folk and rock aes­thet­ics, using Church’s dis­tinc­tive vocals to com­bine the two. While their newest album, White Water, White Bloom, is inter­est­ing in some ways and cer­tain­ly dis­plays musi­cal tal­ent on the part of Sea Wolf, has flaws which pre­vent it from being out­stand­ing. White Water, White Bloom con­tains above-aver­age instru­men­tals. Unfor­tu­nate­ly, the instru­men­tals are not ter­ri­bly far above the aver­age. While “Wicked Blood” opens the album with a slight­ly shrill sound that remains very sim­ple despite a large orches­tra­tion, even­tu­al­ly lead­ing to over-rep­e­ti­tion, oth­er tracks includ­ing “Turn the Dirt Over” use large num­bers of instru­ments to great effect, cre­at­ing inter­est­ing, unique sounds that weave in and out through one anoth­er. Unfor­tu­nate­ly, many of the songs on White Water, White Bloom lie some­where near the aver­age of these exam­ples, with per­fect­ly decent but absolute­ly unex­cep­tion­al lines. Church’s folk­ish vocals fill the expanse cre­at­ed by Sea Wolf’s music, adept­ly telling the epic tales and rem­i­nis­cences of White Water, White Bloom. In the more folk-cen­tered parts of the album, Church’s voice is deep and sub­stan­tial in a way that pro­vides the music with a res­o­nant melody while simul­ta­ne­ous­ly direct­ing its path. How­ev­er, on more ener­getic tracks like “O Maria!,” Church’s voice ends up seem­ing some­what over-extend­ed, hav­ing left its low-key com­fort zone far behind. Much of the album stays between the two points, leav­ing Church’s voice to grav­i­tate between its strongest point on “Wicked Blood” and overex­ten­sion. As both vocals and instru­men­tals con­stant­ly swing from below aver­age to excel­lent to mediocre and back, one can hard­ly be sur­prised to find a very mixed set of tran­si­tions. On one end of the spec­trum, the first three tracks of the album seem so dis­con­nect­ed they could well have been from dif­fer­ent albums. Tran­si­tions do improve from there, not only between tracks (the qui­et end to “O Maria!” quite suc­cess­ful­ly allows its suc­ces­sor, “White Water, White Bloom” to join “O Maria!” as one of the most ener­getic tracks), but between sec­tions of tracks. The best exam­ple is, again, “O Maria!,” which con­tains con­trast­ing sec­tions that man­age to flow well into each oth­er and retain con­nec­tions through con­tin­u­a­tion of at least one line. Sea Wolf’s lyrics, full of vivid metaphor and descrip­tion, focus on sto­ries and images told in Church’s rem­i­nis­cent tone. From short lines which evoke beau­ti­ful­ly detailed men­tal images, like “the dew in the grass had an elec­tric glow,” to longer sto­ries told in song, such as “Turn the Dirt Over“ ‘s “You left your broth­er in a north­ern town / The fer­ry o’er the water on the bay / His body cov­ered by the col­ors going down / Stat­ue in the square before the wind could change.” Lyri­cal­ly, Sea Wolf cul­ti­vates a sort of strange­ness which per­vades their music, lead­ing to a sense of sur­re­al­ism through­out. Occa­sion­al rep­e­ti­tion has the regret­table effect of weak­en­ing the lyri­cal impact, but in gen­er­al, White Water, White Bloom is cer­tain­ly a lyri­cal­ly inter­est­ing album. 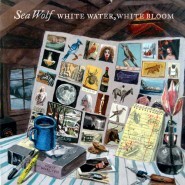 With White Water, White Bloom, Sea Wolf has man­aged an incred­i­bly mixed album. Not only do the instru­men­tals and vocals vary wild­ly through­out the album, but they range wild­ly and inde­pen­dent­ly, leav­ing the over­all sound all the more mixed. In short, the clos­est thing to con­sis­tent on White Water, White Bloom is the lyrics, which, thank­ful­ly, are quite strong. In part because of the lyrics, but also because of an over­all ten­den­cy towards cre­ativ­i­ty, the album does man­age to keep itself solid­ly above aver­age.